Your portfolio can have a positive long term impact when the risk efficiency of your portfolio is maximized. Many investors tend to be risk averse. So, if you are going to assume some risk in your portfolio as a trade off for a higher return, you should aim to get the most out for your investment. A common method for measuring investment “performance” is to take the ratio of excess return of portfolio by its risk. Excess return is difference between the return of the portfolio/stock and risk free investments such as T-Bills. Sharpe ratio is based on the risk that is again represented by the standard deviation of the return. Just as SD is not a strong risk measuring technique, Sharpe ratio is not affected by sequences in which gains and losses occur. This is due to the fact that SD does not recognize strings of losses that result in significant drawdowns in value. In this illustration, the spreadsheet computes four performance measures – Martin Ratio, Sharpe Ratio, Volatility, and Ulcer Index. Since the computations are quite straightforward with just 1100 data points, excel will suffice. This model can be implemented in Matlab or R which have higher analytical horsepower.All computation happens behind the scenes as the program downloads asset and index prices from a web service into the spreadsheet. The spreadsheet usage is quite straightforward. Begin by entering the number of stock symbols (restricted to 10) to build the portfolio, annual risk free rate, benchmark index (Nasdaq, S&P or FTSE), start and end date ranges. The date ranges must have a minimum of 52 week period for meaningful performance measures. Risk adjusted performance measures appear in cells G3 to K13. 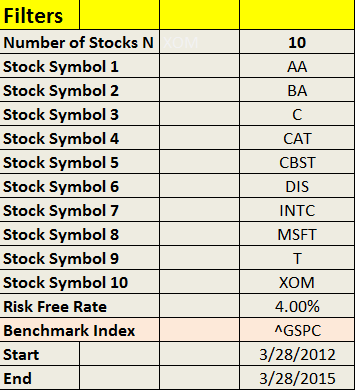 For every asset or stock symbols entered above; UI, Martin ratio, Sharpe ratio, and Standard Deviation are computed. You can re-compute for a different set of symbols, and the program takes care of computing risk adjusted performance measures, all happening behind the scenes. UI measures risk by taking into account drawdowns represented by price declines. The index oscillates around zero as mean returns advance higher.This applies to DIS as shown above, as it has low UI value. This relation is not necessarily true all the time. CBST had the highest average weekly return of 35.37% among all assets in the portfolio, but had higher downside risk 10. Hence, UI measures downside risk that can be used to calculate risk-adjusted to returns, and are good suited for investors with long positions. As you can see from the above chart, Sharpe ratio is a poor indicator because it depends on underlying SD; which in turn covers both upside and downside volatility. Long investors are particularly interested with downside volatility that give rise to “stomach ulcers”. To address this, Peter Martin introduced UPI or Martin Ratio to find assets or stocks with the highest risk adjusted return. Between 1970 and early 2009, there have been few periods of extreme losses among US and international equity markets. The S&P 500 Index’s rolling three-year returns have been positive in all but three periods (1972 – 1975, 2000 – 2003 & 2007 – 2009). During these periods, many ratio formulas failed to work. Negative Sharpe ratios are quite common during prolonged bear markets. They do not provide useful information because the risk-free asset outperforms the investment on a risk-adjusted basis, and investors often flee to bond markets to seek highest risk-adjusted returns available. In this illustration, CAT and XOM have negative Sharpe ratios although XOM had positive average weekly returns over the 3 year period.